Gambian supporters of Opposition candidate Adama Barrow who was in the lead after almost 75 per cent of votes had been counted in Gambian presidential voting, took to the streets to register their jubilation. Barrow, who has the support of seven political parties, had won 22 out of 53 constituencies or 138,148 votes in Thursday’s presidential polls. 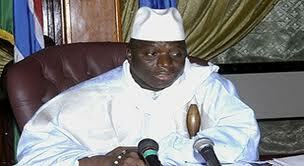 Also, video below shows President Jammeh conceding defeat to opposition leader Adama Barrow.